Tragedy happens on a daily basis. Terrible things happen and we have to somehow deal with the after effects. 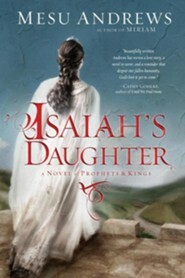 Ishma, the main character in Isaiah’s Daughter does just that. Her parents are murdered, she is raped and taken captive. Her fate is changed, however, when a miracle happens and she and the rest are freed and she ends up in the care of Isaiah and his wife, Aya. Ishma learns through the generosity of Isaiah and his wife that God will take care of you. You can survive the experiences you endure. And she does, by attending a school taught by Isaiah which was unheard of then, and eventually becoming queen alongside childhood sweetheart, Hezekiah. Her name is changed due to being adopted by Isaiah and his wife to Hephzibah which means : delight of God. The queen also learns that sometimes change is a good thing as she adjusts to being in a palace and to officials she meets. Her change is for the better, a better life, a future. A family. I received a free copy of this book from Peguin Random House in exchange for an honest review.